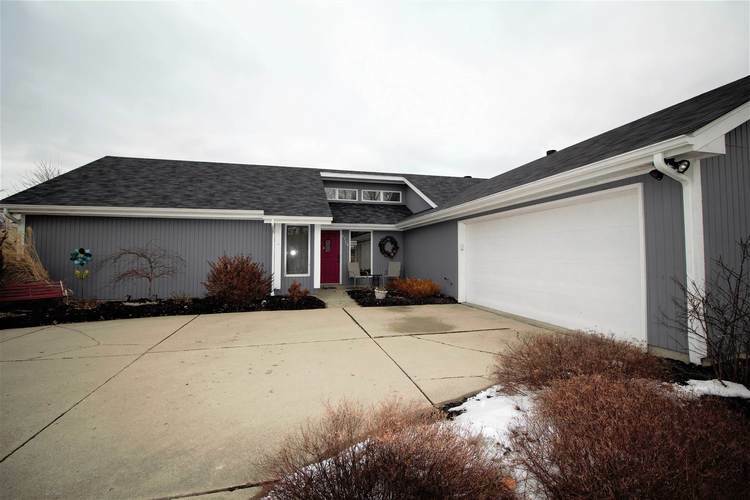 This is a beautiful and well-maintained ranch that features an open floor plan and over 1,500 square feet of living space. Once inside the house you are drawn to the spacious living room with an extraordinary vaulted ceiling. The living room also has clerestory windows that let in a lot of natural light. The living room opens to the family room that possesses a gorgeous floor to ceiling brick fireplace. The kitchen has tile flooring and updated appliances (all of which can be included in the sale). From the kitchen you have easy access to the laundry area, the home’s half bath, and a cozy dining area. You can step outside from the dining area to access the property’s pleasant patio area that has plenty of space to grill out and relax. Back inside and down the hall is where you will find the master bedroom that connects to a walk-in closet and the master bathroom which sports double vanity sinks. When you go back into the hall you will find bedrooms two and three and another full bathroom. The property boasts plenty of attractive exterior features as well. An angled two-car attached garage and landscaping give the property plenty of curb appeal. The back of the property has plenty of backyard space and a space-saving shed for the outdoor equipment. Location is another terrific aspect of this property as it is close to plenty of restaurants and shopping opportunities. Directions:From Maysville Road exit circle onto Landin. Turn Right on Parent Road then left onto Hollendale Drive. Left on Edge Rose Drive then left onto Amberly.